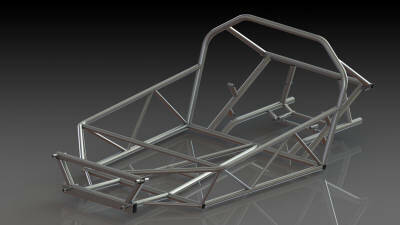 How do you calculate how much tension will be on each joint in the chassis? Is there a formula I can use based on weight, angle, and length? Also, what if I used metal plates and screwed all the tube parts together at the right places instead of welding them? What do you think? You ARE determined and appreciate that much. Now you wish to nut and bolt something and wonder how and which ways it would be strong. 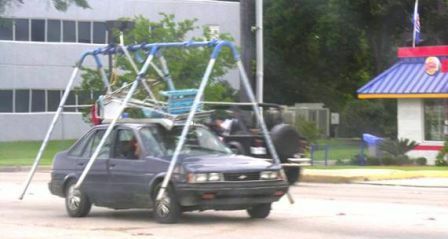 Check out this engineering marvel done by professionals clickable below. It really happened. A bridge well designed to hold plenty of weight but a fatal flaw is simply it couldn't handle or dampen a "harmonic resonance frequency" and if you have to look up what those words mean you need school AND know the people who designed that bridge just plain forgot to consider that too. Now - I'm not designing and didn't which ways what would have to tolerate what but can see that if that bridge was just curved and not straight across that river it wouldn't have done that OR dampened. Mechanical engineering and plain geometry from grade school you can see what works on paper and what likely will not. Factor in all of it. Torque, expansion of metal used under assorted temps and when you stop to think you actually have to think to make a dang swing set out of tube, nuts, bolts so it doesn't tip over in any direction and be strong. Just this shows an improvement over most I know of everywhere as it has support for unexpected side forces not needed for plain load upon it as a swing set! Takes thought and knowledge of the materials used plus exposure to what else. Think of a simple aluminum soda can and you can try this. You can stand on an empty one if intact. Careful now I don't want you to hurt yourself but then just tap the side of the can with say a pencil and watch it collapse flat in a nanosecond. They've made these mistakes in automotive places since forever too. Cars that if you jacked up just one wheel and opened a door the roof buckled - real as late as 1975 - a production car! Stay motivated but learn the geometry and engineering of anything you wish to be what. You are correct that this is the internet and info can be obtained. What you miss is hands on with the tools involved that a school would have and you would acquire as needed plus a place to put everything. Lots to think about. You can make it strong but would it end up too heavy for what you need? You can design strong and light weight with some thought. Yikes, then is it safe! OMG the issues never end. Quite seriously again. It's YOUR unstoppable motivation that will win or lose. I'm a hopeless optimist such that when I find something that didn't work out it wasn't a failure but rather a success at finding out what didn't work! Welding is it's own skill, trade and art. What material would be best for what and so on. My own interests were repair to existing designs of just things in general. Spend too much time looking at things that didn't last that could of with more thought. If you want to make more than one then consider how much time it would take to make and throw that in to the scene along with costs to mass produce anything. I'm sure getting to be an old phart. With cars for example the manufacturers would first make prototypes and expose it to assorted conditions, miles and what gave out too early and hopefully correct that before selling the first ones that earlier on took well paid skilled labor. That's fine when price is no object but it always is when competing. Never quit thinking. You may stumble upon something that's lighter, stronger and easier to assemble new but can you work with it when used makes concepts a real challenge. You are a hoot DS as usual. A neighbor friend had one, kids grew up and she didn't know how to get rid of it. I call it the "blue" wrench and cut it into bits (just oxy/acet) so it could go out in municipal trash at the time that is fussy what you dispose of. Nick is the welder here. I can just don't look at what I did. One small spot fine. Really do it up right - not my thing and don't have the right stuff or need it either. If you could just bolt it together and it would be as strong as welding, I would be on unemployment right now. See, I used to be a tech but am now a fabrication welder. I have multiple fracture critical certifications and I weld bridges for a living. So I know a little bit about making two pieces of metal go together. Screws to hold a chassis together? At that rate save yourself to money on the drill and use duct tape. The tensile strength of the steel would be meaningless as it would all hinge upon a few screws that would be in holes which went against the grain of the steel and concentrated the focal stresses of the structure directly upon the weakest place in the structure. I get it, you watch too much tv or youtube or whatever the hell. You have no idea what end of a welder is up or how to turn it on. But you think not only that you can build a tube chassis with no tools or knowledge of metallury, engineering, physics or welding, but you also believe that you can learn these things on the internet. Even the Red Green show wouldn't air what you are saying you want to do! One of my projects to tackle this year is to get a few more pieces of fabrication equipment and build a tube chassis dune buggy. Going to power it with a Yamaha 1100 motorcycle engine and transmission. I won't be looking around forums asking if I can just use screws because I do not own and cannot use a welder, I won't be guessing and hoping and praying it will come out right. I will take my time to design and build it because I have been dealing with metal fabrication and bracing focal points of stress in steel for years and I know what I am doing. I always thought it would be cool years ago to have something like that, but I realized I didn't know how to do it right. Now I do know, I'm going to do it right and the kids are going to need to wear helmets when they drive it. Maybe you had one of those teachers or parents who told you that you can do absolutely anything you put your mind to. Well I'm sorry to bust your balloon here but no matter how hard you put your mind to it, a person without the ability and wisdom that only comes from years of working with steel can make a tube chassis, custom body, etc. no matter how much they use google on their phone hoping for the magic answer. Thats why there are shops that do this, and a tube chassis custom body C5 like you are talking about starts at $100,000 to do. Also another reason you don't see them all over the streets like a maroon Taurus or a silver Camry. You really need to learn to live within your limits. If you want to work with steel, go to school for welding. If you want to learn cars, go to school the be a mechanic. If you just want to dream in a fantasy world, grab a 1/2 oz and some shrooms and play Dungeons and Dragons. But please make your next posting here so intelligent and well worded that I will sit back suddenly in my chair and think that Mark Twain has possessed your body and is using your keyboard to speak directly to the center of my brain. Otherwise you are honestly wasting everyone's time here. A tube chassis's strength is the sum of all its parts . It's been said a project be it a chassis , bridge or airboat seat package is only as strong as its weakest link. With a screw/bolt together frame the odds are pretty good that one screw will loosen up or a hole will need to be "relaxed" a bit to start a bolt.As nick i'm sure will agree , a proper weld is strongest part of a tube frame. Back in the day me and some buddies built a sand (mud) rail . We just took and torched a olds tornado front drive assy with a 455 eng.Took drive assy w/ suspension and rolled it up to the rear of the tube chassis, put on a set of paddle We then promptly took it out and broke the frame in several places .We then spent the money on a tubing notcher . And built a correct frame .